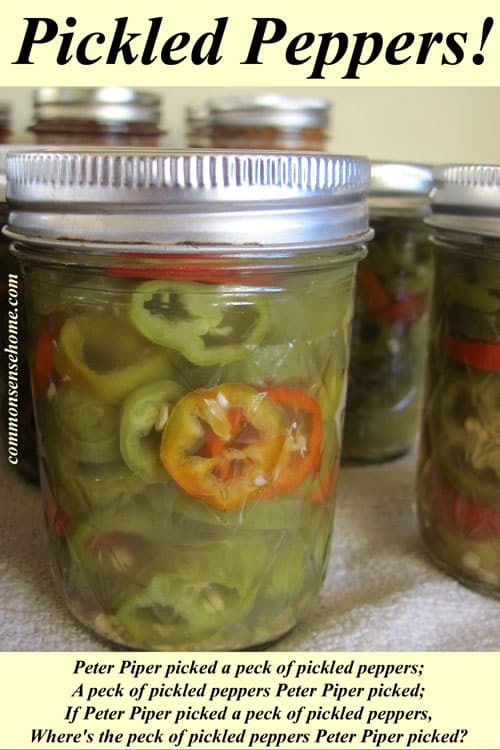 Now you can enjoy pickled peppers year round with this easy four ingredient canning recipe. For this recipe, you can use jalapeno peppers, banana peppers, or whatever other hot peppers you have available. Many of our hot peppers go into our homemade salsa (which has gotten hotter as the boys have gotten older), but I like to make up a batch of pickled peppers each year to use in tacos and enchiladas, or even to toss over the top of a roast when we want a little extra heat. 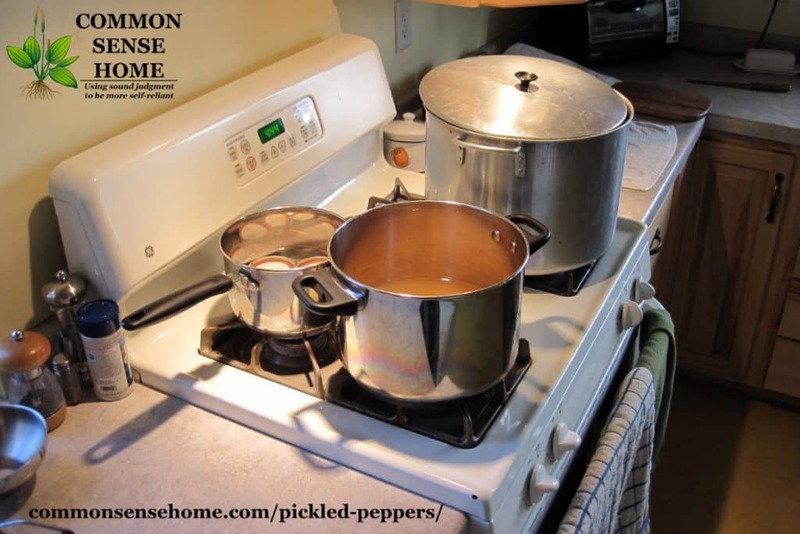 Because hot peppers are not acidic, using a vinegar pickle allows them to be processed in boiling water bath canner. I also have recipes for No Can Dill Pickles, Homemade Ketchup and Pickle Relish. Making your own condiments is a great way to avoid the stuff you don't want, like artificial colors and BPA (which a new study reveals is still in many canned foods). The flavor of homemade condiments is brighter and fresher, too. My husband's not a relish fan, so the look on his face when he tried my homemade relish was priceless. He said, “I don't like relish – but this is good!” The no canning dill pickles are still crunchy. The ketchup tastes like ripe tomatoes instead of sugar, and the peppers have zing and heat. Prepare water bath canner, clean hot jars, and clean two piece lids. Wash hot peppers. Leave peppers whole or cut into slices. 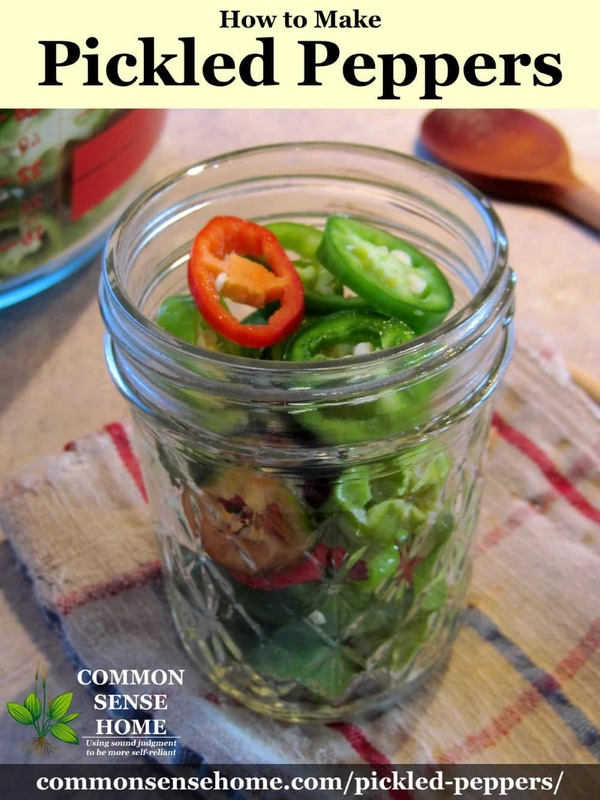 If using different varieties, toss to blend so you have a mix of peppers in each jar. Combine vinegar, water and garlic in a large sauce pot. Bring liquid to a boil; reduce heat and simmer about 5 minutes. Discard garlic. Pack hot peppers into hot jars; leaving 1/4 inch headspace. Ladle hot liquid over peppers, leaving 1/4 inch headspace. Remove air bubbles. Wipe rim clean and seal with two piece canning lids. Process pickled peppers 10 minutes in a boiling water bath canner. Makes about 5 pints. 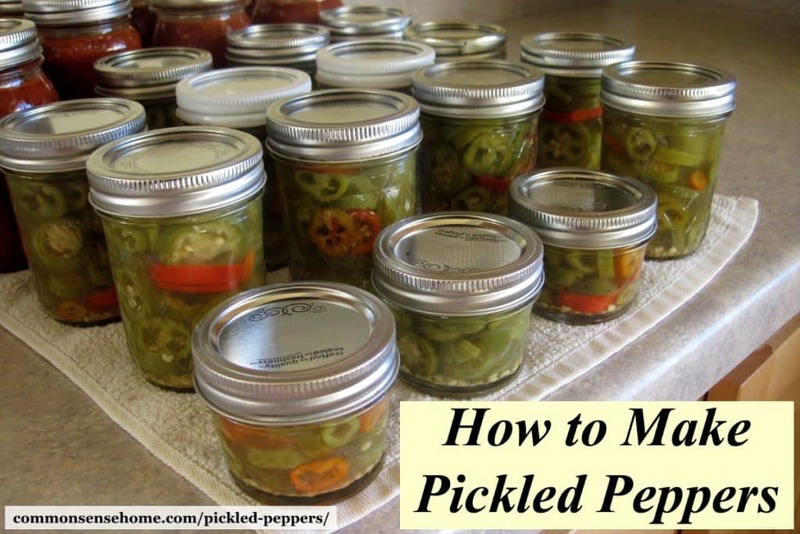 I prefer to pack mine in half pint and half cup jars, because we tend to go through a smaller amount of peppers at one time. Note: When cutting or seeding hot peppers, wear rubber gloves to prevent hands from being burned. DO NOT touch your eyes or other sensitive areas with hot peppers. If you get pepper oils on your hands, coat affected areas with cooking oils (capsaicin is fat soluble) and wash with dish soap to help remove the oils. Alternatively, you may try scrubbing hands with alcohol, which can help dissolve and wash away the capsaicin. 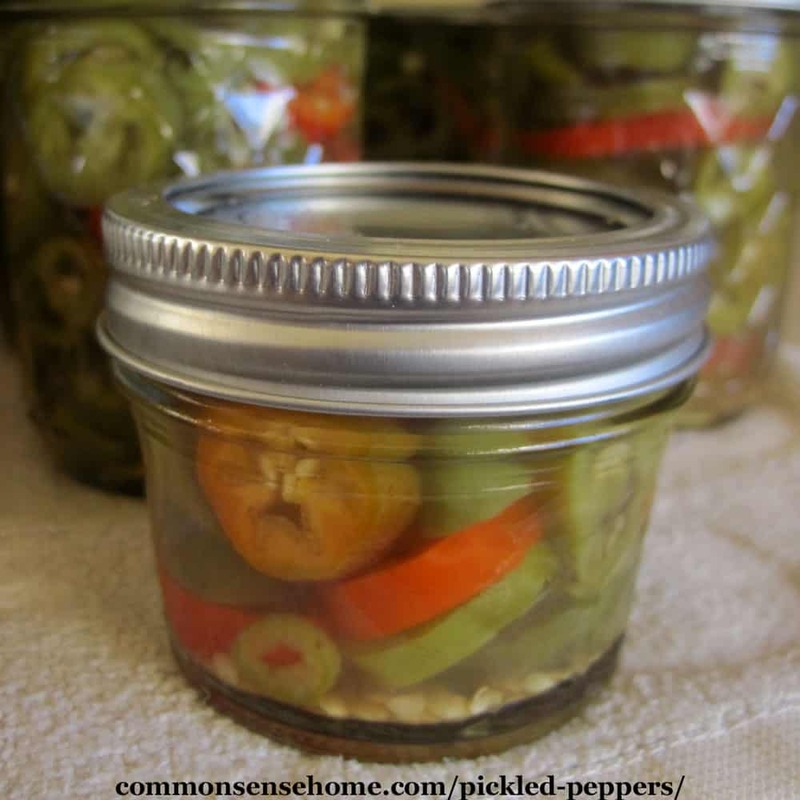 Enjoy pickled peppers year round with this easy four ingredient canning recipe. 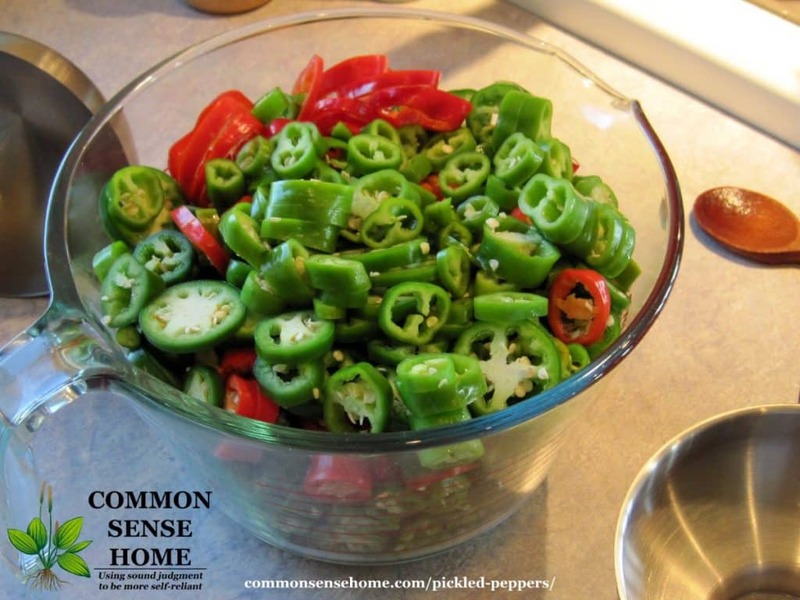 Use your favorite mix of hot peppers or banana peppers. Prepare boiling water bath canner, clean hot jars, and clean two piece lids. Process pickled peppers 10 minutes in a boiling water bath canner. Makes about 5 pints. I prefer to pack mine in half pint and half cup jars, because we tend to go through a smaller amount of peppers at one time. When cutting or seeding hot peppers, wear rubber gloves to prevent hands from being burned. DO NOT touch your eyes or other sensitive areas with hot peppers. If you get pepper oils on your hands, coat affected areas with cooking oils (capsaicin is fat soluble) and wash with dish soap to help remove the oils. Alternatively, you may try scrubbing hands with alcohol, which can help dissolve and wash away the capsaicin. After all these years, I still can't say that thing very fast! As always, comments, shares and pins much appreciated! Are you a pickler? 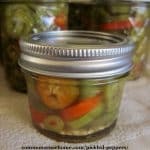 Do you can or lactoferment your pickled veggies? What's your favorite veggie to pickle, or a recipe you'd like to have? Share your thoughts below. Originally published in 2015, updated in 2018. We put up a lot of pepper, but were not pleased with the soft consistency of the pickled peppers. We had a tremendous crop a few years ago, so we thought why not put some in lime water to see if they come out crispy. They did and people rave about how good they are. We soaked them over night, but a few hours may be enough. Laurie, Do you do anything special to keep them from getting soggy? This is essentially the recipe I use and the peppers are just not crisp when they come out of the canner. Fine for cooking with, but yucky alongside a sandwich. I usually cook with mine, so I don’t worry about crispy, but I bet the trick of adding leaves with tannins in them like grape, oak, raspberry, blackberry, or cherry leaves would help make the peppers crisp/firmer.